75226 Inferno Squad Battle Pack is a Star Wars set released in 2019. Collect a unique Star Wars™ TIE fighter inspired collectible toy and 4 great minifigures. 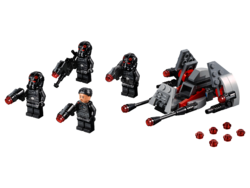 Add iconic Star Wars™ characters to your collection with the LEGO® Star Wars 75226 Inferno Squad Battle Pack. 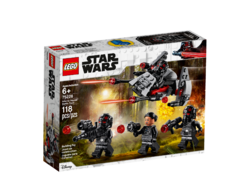 Featuring a TIE fighter style speeder with stud shooters and space for a minifigure, plus 3 Inferno Squad Agents and brave heroine Iden Versio, any fan will love to expand their LEGO Star Wars universe with this collectible construction toy. Includes 4 LEGO® Star Wars™ minifigures: Iden Versio and 3 Inferno Squad Agents. Features a TIE fighter inspired speeder with 2 stud shooters and space for a minifigure. Weapons include 2 stud blasters, a stud blaster rifle and a stud rocket launcher. Play out exciting scenes as you help the Imperial troopers track down the Rebels. All characters in this set are new for January 2019. Speeder building toy measures over 1” (4cm) high, 4” (11cm) long and 3” (9cm) wide. Facts about "75226 Inferno Squad Battle Pack"
This page was last edited on 9 February 2019, at 22:15.